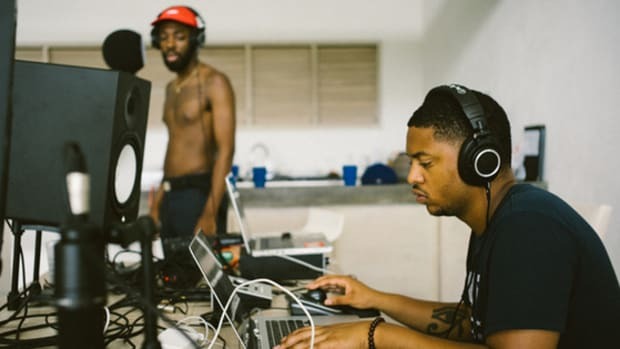 Brent Faiyaz's GRAMMY campaign spoke directly to a younger audience. It was hip-hop. They said no. In October 2016, Chance The Rapper took out a full-page ad in the yearly GRAMMY preview issue of Billboard that read: “Hey, why not me?” It featured an image of the young rapper posing in his signature tan overalls and "Chance 3" hat. The advertisement was his first time participating in For Your Consideration, an award show tradition of artists and musicians campaigning to increase visibility in hopes of being selected for nomination by the GRAMMY committee during the first round of votes (Oct. 17—31). Usually, the ads are album covers or a press photo with a collection of glowing quotes and noteworthy accolades. Unlike most of his peers, Chance chose an approach outside the industry norm. Pitchfork’s Noah Yoo called the GRAMMY consideration promotion “adorable.” Pigeon & Planes’ Adrienne Black applauded the “fun” approach. Spin&apos;s Brian Josephs said it best in his headline, “Chance the Rapper Is Unafraid to Admit He Really Wants a Grammy.” Virality is the best form of visibility, even when the image is in a print magazine. 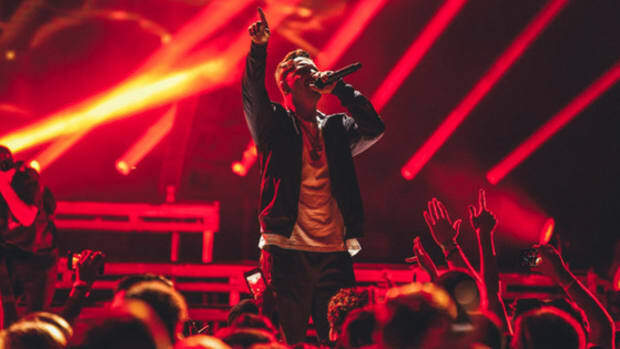 For Chance, a rapper independent of a major record label who releases music without a price tag, the opportunity became an agent of change. 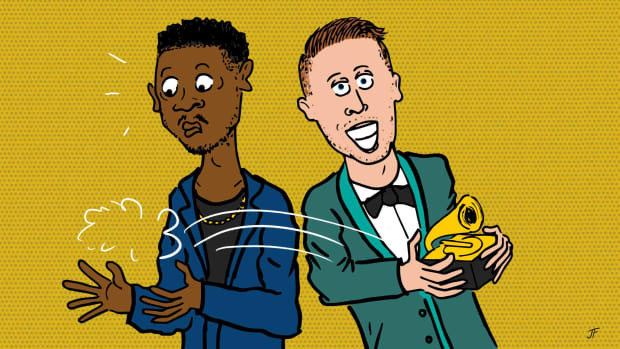 Shortly thereafter, The Recording Academy revamped their rules of eligibility to include streaming-only releases in June, an adjustment that allowed the Chicago native to win Best Rap Album in 2017 for his free "mixtape," Coloring Book. 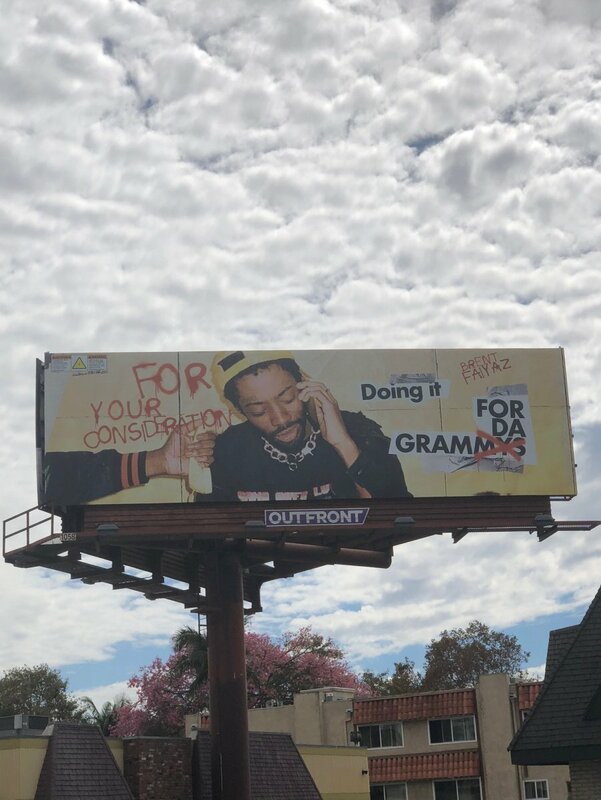 Currently, there are five billboards of Brent Faiyaz beneath the clouds scattered about Mid-City and West Los Angeles. The 23-year-old singer is on a cell phone, his face looking downward. To his left is a hand extending a retro corded handset and the words "For Your Consideration" spray-painted in red. 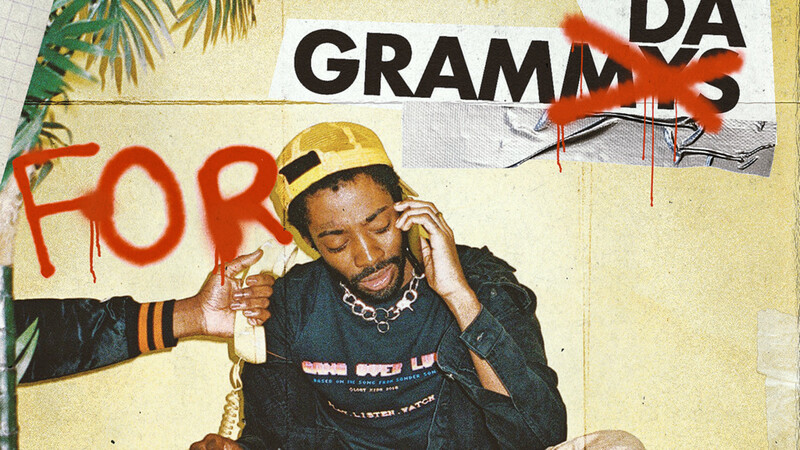 The upper right-hand corner of the billboard has his name—also in red—alongside the words "Doing It For Da GRAMMYS" but with the "MYS" X-ed out, thus reading as "GRAM." The advertisement could confuse the uninformed. 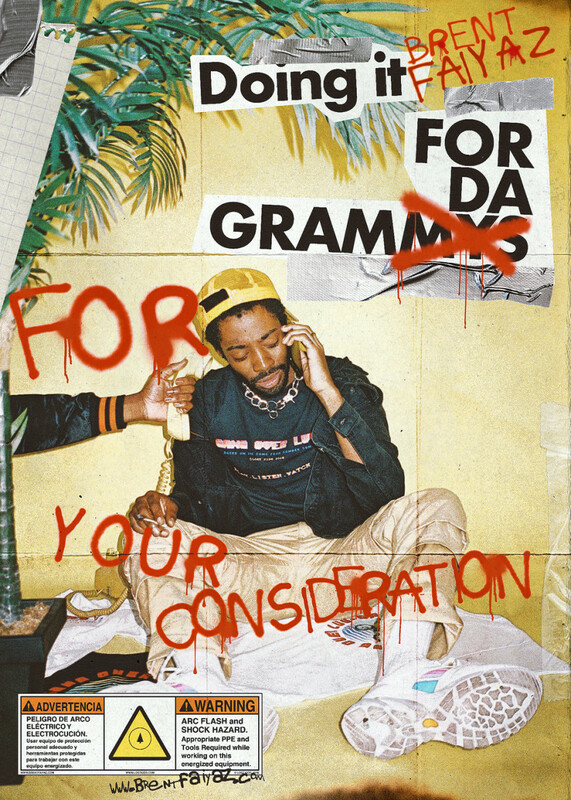 But for those who know what October brings, the image stands as a direct message to GRAMMY voters that Brent Faiyaz is an option on their ballots; consider him. 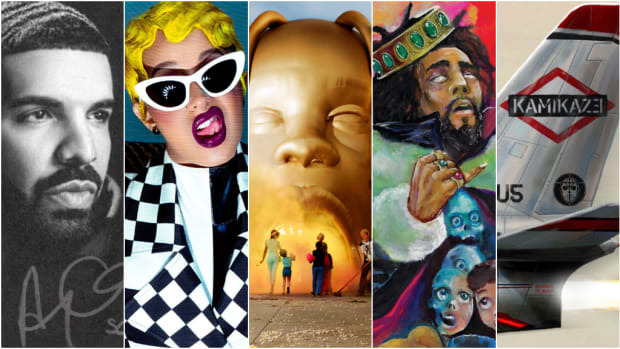 An additional ad—a brighter, bolder version than on actual billboards—was intended for Billboard’s 2019 GRAMMY preview print issue. There’s a shock hazard warning sign tucked into the bottom left corner in both English and Spanish. The stark yellow background is striking, a color that complements the image and its candor. Brent’s For Your Consideration creative direction was unlike traditional submissions. It’s similar to Chance in execution—no album cover, quotes, or accolades—except he doesn’t politely ask to be picked. The image has a rebellious spirit. It jumps out at you and reads more like, "Pick me, if you dare." If you flip through Billboard&apos;s October issue with Ella Mai, Dua Lipa, and Post Malone on the cover, countless For Your Consideration ads are found within the 200-page magazine. The first is Drake’s Scorpion, while the last Tommy K.’s Someday Someway EP. 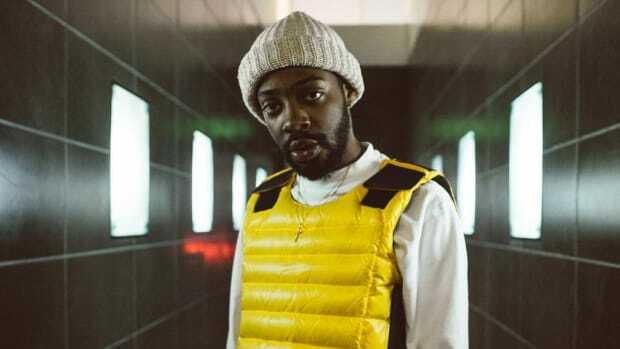 Situated between the two is marketing for Taylor Swift, Lil Peep, Camila Cabello, dvsn, and Mac Miller, to name a few, but Brent Faiyaz is nowhere to be found. “We making our own version of what history looks like through being creative. That’s all we were doing, being creative,” Brent Faiyaz’s manager, Ty Baisden, says when asked about their original ad. Sadly, their decision to challenge the “safe and boring major-label approach” was rejected by the Recording Academy. Spraying over “GRAMMY” to make “GRAM” was a transformation in the name of youthfulness. The entire ad can be seen as an explicit metaphor for recognizing the past while stepping into the present. Where else but Instagram would a 23-year-old post their GRAMMY for the world to see? Instead of appealing to the likely older, less hip GRAMMY committee, Brent’s campaign spoke directly to a younger audience. The kids are more likely to do it for the &apos;Gram than for a GRAMMY. The Columbia, Maryland-born artist aimed to find that intersection between displaying the old and representing a young, black perspective within the institution. Safe isn’t how Baisden operates. He carries the raw disposition of someone who will shake the table for his vision rather than arrive and sit comfortably wearing the suit of someone else&apos;s choosing. Last year, he pulled back the ugly curtain on the major-label ballgame in an interview with DJBooth. Safe isn’t how Brent operates, either. To choose independence over signing to a major label isn’t a decision for the weak. 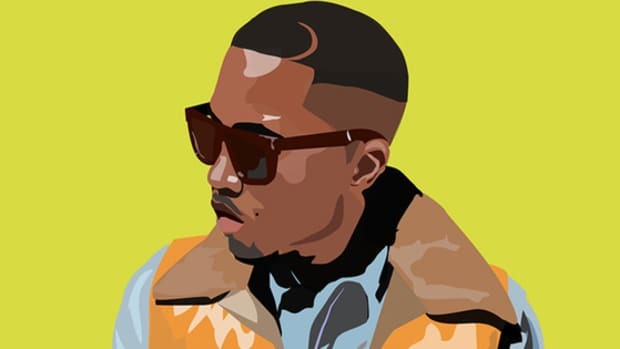 Even though Brent sings R&B, hip-hop’s edge is present in both his music and marketing. Genre doesn’t separate the culture’s influence. Together, Brent and Baisden were thinking hip-hop. The attitude, the spray paint, and overall energy. With hip-hop weaving within various corporate entities, it begs the question: How much must one&apos;s voice be compromised to fit in? 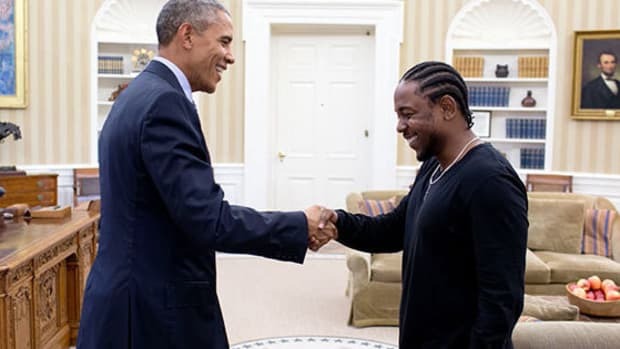 Fitting in isn&apos;t what hip-hop was built upon. In late February 1989, DJ Jazzy Jeff and The Fresh Prince’s “Parents Just Don’t Understand” won hip-hop’s first-ever GRAMMY Award for Best Rap Performance. Prior to the Philadelphia-born duo’s victory, the esteemed awards ceremony didn’t even have a category honoring rap. 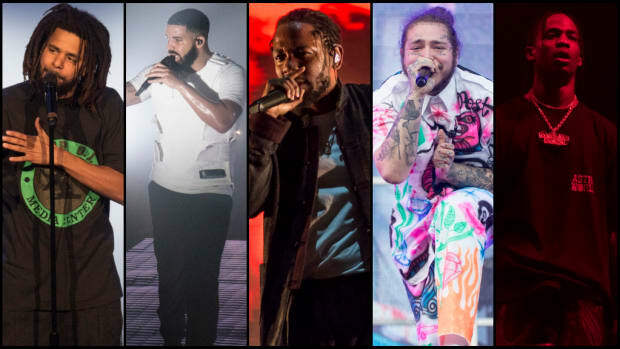 Based solely on their nominations, the 31st Annual GRAMMY Awards was destined to be written into hip-hop’s history books, but the decision to present their golden gramophone during the GRAMMYs pre-show and not part of the televised presentation soured what was meant to be a moment of progressive recognition. Hip-hop was included in “Music&apos;s Biggest Night”—rightfully recognized—but not publicly acknowledged in primetime. DJ Jazzy Jeff and The Fresh Prince, alongside industry peers, chose to boycott instead of accepting the invitation to attend, an action more impactful than the trophy they received. Hip-hop and the GRAMMYs have always had an unsteady relationship. There has been hope, but moments of progression tend to be followed by instances of stagnancy. With both Chance and Brent, it’s clear that the GRAMMYs embrace representation, but only by adhering to their strict rules. Unfortunately, the results of confining creativity tend to be safe, boring, and unimaginative. That&apos;s not hip-hop. Baisden wasn’t discouraged by The Recording Academy’s rejection. The billboards and other forms of grassroots marketing were used to spread Brent’s name and likeness. They also saved $5,000, the cost of a full-page advertisement in the print version of Billboard&apos;s GRAMMY preview. As he stated, matter-of-factly, “It wasn’t like they were stopping us. There are so many ways you can advertise things. Next year will be bolder than this one." History isn’t made because things stay the same. History is made when what has been accepted is challenged. Brent and Baisden are constantly challenging the traditional and the established. We&apos;ve seen what has happened with others who walked a similar path.